The main aspect of the Drake Titanium are the four different programs that permit specific functions for deep apnoea, static apnoea, spearfishing and swimming pool training. The functions of the PRO program are focused on deep apnoea, starting from the indication, when on the surface, of the avarage descent and ascent speed, and the avarage of total speed of the dive. This data is extremely important to optimize effort and equalization process. The Drake Titanium differs in such function from the Mares Smart Apnea, which indicates maximum descent and ascent speeds. 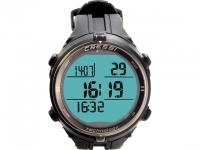 If set on the PRO program the new Cressi computer watch will always show on display the Time Ratio, meaning the ratio between surface time and dive time, and the Recommended Recovery time, a function which can be set by the diver. 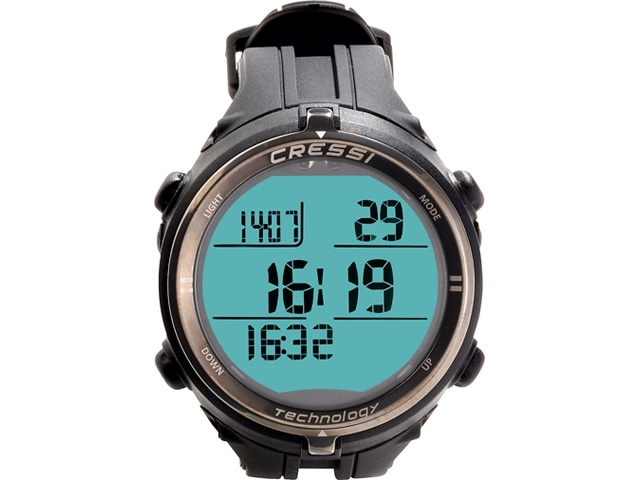 Underwater instant depth and dive time will be shown in the central row of the display. On the surface, in the same position, maximum depth and dive time of the last immersion will be indicated. Recovery time will be shown on top right of the display. Very interesting is the possibility to use the PRO AVG function simply by pressing a button: instead of the values of the previous dive, the avarage values will be displayed. These values are an indication of how much we are "pushing". 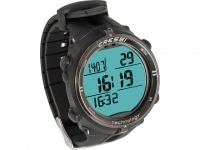 The display will show avarage values of dive time and depth of all the previous dives, the surface time, the avarage Time Ratio, while in the last row, a solution that can be used in all 4 programs, it will be possible to choose no indication, the number of previous dives, the minimum temperture of the last dive, the Recovery time suggested or the hour of the day. 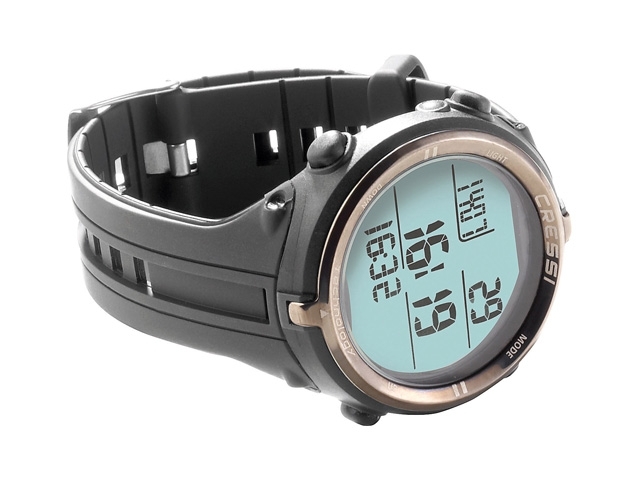 Many are the alarms in the PRO program, from the surface time value, to the depth, which can be divided in different steps, to the dive time and the maximum number of dives, to the automatic lighting of the display. All the alarms activate as flashing text and/or sound alarm. The latter can be disabled. Simply by pressing a button it is possible to have either the total dive time or the surface time. The FREE program is indicated for spearfishing, as it makes more simple the reading of the informations on display, showing only main data: maximum depth, dive time, minimum temperature and number of the last immersion. Instead of the number of dives the RRT (Recomended Recovery Time) can be shown, or else the time of day. This last information is quite useful and is not always present. In fact, for example, two of the watches tested by AP show time when in the water, but only selecting the right option bby pressing each time a certain button. Often we need to be back from our spearfishing session at a certain time, for example because we have set an appointment with other spearos back on the boat, or because we have one of those "unmissable" family duties, or simply to know the time and organize best the program of our fishing day. The alarms of the FREE program are the same of the PRO, except for the automatic light and the depth alarms at intermediate steps. Specific for training in the pool, the Dynamic program has a special countrt of pools swam and can save training charts with increasing and decreasing times. Starts every X seconds can be set, or fixed or variable recovery times. The PRO and FREE programs are activated automatically under 1.3 meters of depth, while the DYNAMIC program activates already at 0.8 meters, so it can be used in the swimming pool, still avoiding automatic activation. Interesting is the possibility to register up to 9 different training programs. Thought for static apnoea, the STATIC program controls totally the apnoea. Very interesting is the alarm for dive time: this can be set at constant time intervals, or setting the first interval (usually by far the longest) and after that constant additional intervals. The STATIC program also gives the possibility to have a double stopwatch, to calculate time of first contraction of the diaphragm, and then the time to the second contraction. All data shown in the four programs described can all be downloaded and shown on PC, through an infrared system. This is a sort of cover to the watch display which, through a USB cable, downloads all the info on PC. This Product was added to our catalogue on Wednesday, 09. December 2015.